Congratulations! You're on the right path toward a more flexible, powerful HIE solution (and greater peace of mind). 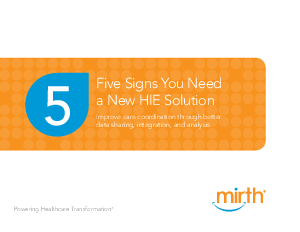 The thought of moving to a new HIE solution can be tough. But as one of our new replacement clients, Rob Hack, Executive Director at HealtheConnections, recently said "The risk of doing nothing was far greater than the risk of making a switch." Hear some real client examples in our next communications.